6% of greenhouse gas emissions in the US are associated with Americans’ meat consumption. Worldwide, emissions resulting from the production, processing and distribution of livestock make up nearly 18% of global emissions. 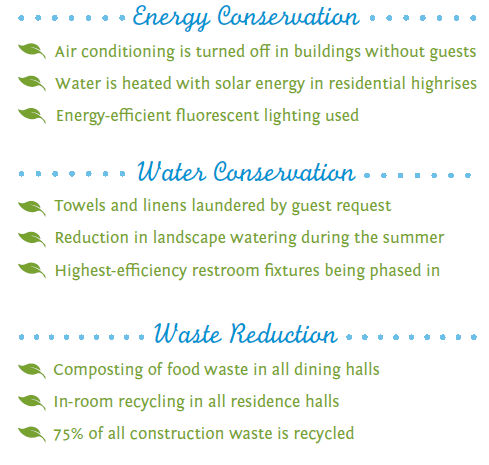 Currently, UCLA Catering is focusing on lessening its environmental impact through waste management. Save your leftover service items (like forks, plates, cups, stirrers, etc.). You can use them for your next event. Encourage guests to use their own reusable mug or water bottle. Paper cups used for coffee, tea, and water amount to as many as 5,000 cups thrown away on a university campus…daily. Order less beef and lamb. Ounce-per-ounce, beef and lamb result in 2–3 times the carbon equivalent emissions as chicken and turkey. Skip the meat and cheese. Vegetarian or vegan options have lower carbon footprints. Request food items that are organic. USDA Certified Organic foods, which are food produced without pesticides or genetic modification, are better for the planet. Choose self-serve platters rather than box lunches. Self-serve platters save paper and plastic, as well as food waste. With boxed lunches, guests do not control the selection of side dishes and condiments; all are included in a box, and many of those items get thrown away. Recycle plates, bowls, and cups. ALL black and clear plastic served by UCLA Catering is recycling numbers 1–6 and can be recycled on campus. Order whole fruit, not sliced. Whole fruit can be saved or taken home easily. Sliced fruit does not keep well. Order domestic cheese over imported cheese. Imported cheeses have a higher footprint because of the need to transport those products from long distances. Domestic cheese distribution reduces the amount of miles needed to travel. Order drinks in bulk containers—not individual bottles. Bulk beverages reduce the amount of packaging needed to contain those liquids. Have recycling containers available and easily accessible. Be sure to work with your Event Planner to ensure that recycling containers are available. When Catering staff is servicing an event, recyclables are collected and recycled. Make your next event green by certifying it with our Green Seal! Even if you don’t have time to certify your event, check out the Green Events Guide to get your event started!